Girl group TWICE revealed unit teaser images and a M/V teaser for their new song Fancy which will be released on 6 pm, April 22. Unlike the photos revealed on April 12 which had a much more calm and soothing atmosphere, these images show TWICE members taking a selfie in colorful outfits with a bright pink background. The M/V teaser shows off Jungyeon walking through a rose bush. She then pricks herself from the thorns of the rose and stares at the camera directly with a blank face, intriguing the viewers into what will happen next. Jungyeon's new long hair is also of great interest since Jungyeon has usually kept her hair short. 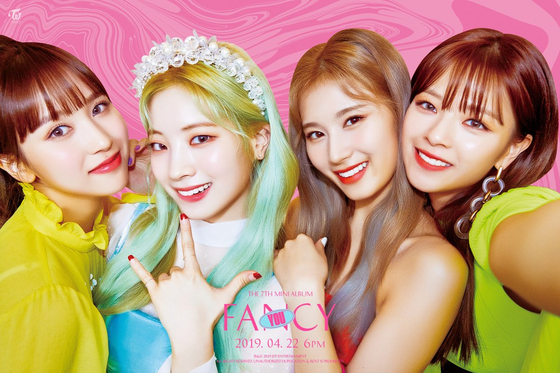 TWICE's 7th mini album FANCY YOU will be released on April 22. The title song FANCY will have a completely different concept from the previous hit songs. It is gaining much anticipation from fans for the song is known to be written by Black Eyed Pilseung who also wrote OOH-AHH, Cheer up, TT, and Likey.